Rebalancing your investments can help boost your returns and minimize risk. This simple contrarian move can help you compound your investment gains over time. With the markets at an all-time high, this may be a good time to rebalance your portfolio. On May 18, 2007, the Dow closed at another all-time high of 13,556.53 setting its 24th record high this year. The S&P 500 recently broke its all-time high of 1,527.46 set in March 2000. Many investors are getting nervous that these records mean that the markets are overvalued and due for a large correction. One way to look at the S&P 500 is that this index of U. S. large cap stocks has not made investors any money in the last six and a half years. The S&P 500 has only just returned to where it was seven years ago. However, at the height of the bull market in the late 1990’s, the P/E ratio of the S&P 500 index spiked above 30. Now, the P/E ratio is about 17, meaning the stocks look much more attractive to buy now than they did in 2000. Other indexes such as the MSCI EAFE Index of international stocks, the MSCI Emerging Markets Index or the Russell 2000 Index of U. S. small cap stocks have been quietly setting new highs for some time now. One way to look at the markets is that when the markets are behaving well and appreciating at 11% percent each year, on average, they will be setting new highs almost on a daily basis. But, of course, we know from experience that the markets are not that well-behaved. They generally do not return a nice steady 11% per year. Over time, market returns are more like 18% for three consecutive years and then negative 10% another year. Perhaps this is the year for negative 10% return. If you have set a diversified asset allocation, then whenever you aren’t sure about what to do, simply rebalance your portfolio every year. Rebalancing your portfolio is a contrarian move which will help you buy low and sell high and will save you from chasing performance. Imagine your portfolio has only stocks and bonds. If stocks have done well, then applying a rebalancing strategy will help you sell some stocks when they are high and put money into bonds when they are low. If stocks have performed poorly, then rebalancing to sell some bonds and buy stocks will most likely be a good contrarian move. 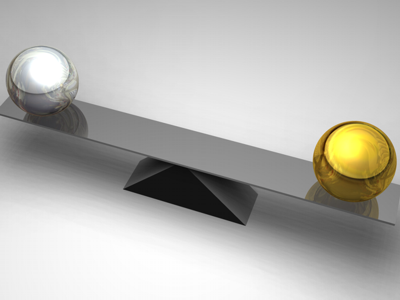 Rebalancing, will save you from trading too much to chase recent market performance, which is nearly always a bad idea. Let’s imagine you have an investment account with a value of $100,000 and your target asset allocation is half stocks and half bonds. Because you neglected to rebalance your portfolio for several years, the stocks have increased in value and now represent 70% of your account with bonds comprising only 30% of the account’s value. Imagine that bonds are expected to return 6% for the next two years, and stocks are either going to go up 10% for two years or else they are going to go down 10% the first year and then go up 10% the second year. If you don’t rebalance your portfolio and the markets correct by 10% the first year, and then rebound by 10% the second year, you will earn 3.01% over the two years. If you rebalance each of the next two years and the markets correct you will earn 6.23%. Failing to rebalance will cost you 3.22%. In this case rebalancing takes money out of stocks before they correct and then puts money back into stocks before they rebound. Rebalancing moves the money in exactly the right direction. If you neglect your portfolio and let your winners ride and the markets continue to go up, you will earn 18.41% over two years. If you choose to rebalance each of the next two years and the markets continue to go up, you will earn 17.07%. Rebalancing will only cost you 1.34%, and you will still earn 17.07% for the year. In this case, rebalancing takes some of your money out of stocks. Then, in the second year, you take more profits off of the table as the remainder of your stocks continues to rise. In this case, rebalancing can save you 3.22% on the downside, but cost you only 1.34% on the upside. While implementing a dynamic asset allocation may allow you to boost returns, the average investor usually does not have the time or the expertise to follow the numerous factors needed to construct this kind of model. More often than not, trying to follow sector trends results in the exact opposite of what following a more sophisticated approach would suggest. You can avoid this temptation by simply rebalancing your investments annually, or more frequently, whenever the markets are hitting new highs as consistently as they have been recently.